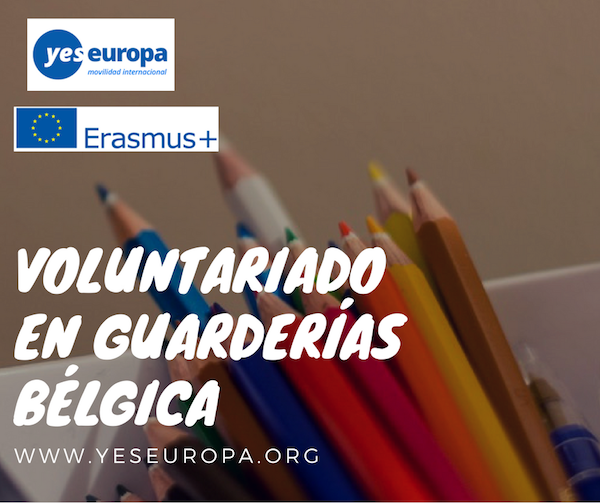 Oportunidad de voluntariado guarderías Bélgica para jóvenes menores de 30 años con el Programa Erasmus+ con todos los gastos pagados. Para conocer más plazas de Servicio Voluntario Europeo en Bélgica. For the project Loverval, an excellent knowledge of the Dutch or the English is required ; the knowledge of the French would be a serious advantage. This work requires a good physical condition and good resistance because of thankless weather in our region ( temperate cold). The association Loverval provides education from kindergarten to the end of the traditional humanities. All general courses prescribed by the Ministry of Education are monitored and supervised by inspectors of the Ministry. One end of humanity official diploma is awarded to any student who passed his graduation exams. General educational school, our Institute has the ambition to provide all students with an intellectual formation value to pursue higher education and to train young people, blossomed, respectful of others, responsible for their actions and able to integrate into civil society. Pedagogically, it is indispensable, through the various reforms introduced into our teaching in recent years, to achieve a synthesis between tradition and innovation. At the end of their schooling, we aim educated youth of course, but also able to adapt to new demands and open to other environments. On the educational level, we continue to preconize a discipline based on respect for the other, clear, firm, however benevolent. In any circumstance, our youth learn to negotiate rather than confront, both now with classmates, teachers or … yourself, tomorrow in their family and professional environment. Respect for others, respect for the environment, but also self-respect: education to health is a challenge that our society is facing an emergency. Sedentary lifestyle and addiction threaten the balance and health of our future adults. It is therefore vital to help them structure firmly, to inculcate a taste for physical exercise and habits of a healthy food, through activities organized by the professors. Among the taught subjects, language courses are included: French, Dutch, English and German and by qualified teachers. The school is run by an Organizing Authority and directors for each type of education. The Organizing Authority is composed of a chairman and administrators; all administrators are volunteers who devote their time and energy to support the directors in patrinomy, financial and administrative management that a school requires. After hosting a few years ago an Australian student whose native language is English, we want to renew, under the EVS that experience. Besides the Organizing Authority, the Institute for Secondary Education is headed by a director and a deputy director. Administrative tasks are split between 3 people and 6 educators are in support. The faculty comprises 69 teachers to provide all the courses. 12 teachers are responsible for the learning of modern languages. Based in Belgium, 6 Kms south of Charleroi (and 50 km south of Brussels), Loverval is a town of 1937 inhabitants (31/12/2004) part of the entity of Gerpinnes. This entity also includes the towns of Gerpinnes, Gougnies, Acoz, Villers Pottery and Joncret. A recreation center, an Olympic pool and a forest allow many sports. Our school is located in a wonderful wooded area and we are concerned not only to constantly maintain the buildings but also to undertake new construction to meet the quality standards but also to the extensions necessary to accommodate a still growing number of students. And so the construction of a nursery is being scheduled to open in 2017. Finally, the school, located along the National 5, enjoys many bus connections for the transport of our students. For international routes: with regards to road traffic, we are close to the motorway ring R3 which is connected to the motorway of Wallonia. With regards to air traffic, the airport BSCA (Brussels South Charleroi Airport) is less than 10 Min by car. 2. Charleroi is a Frenchspeaking Belgian municipality located in the Walloon Region, Hainaut province, on the Sambre. It is the capital of the administrative district of Charleroi encompassing 14 municipalities with a total area of ​​554.55 km2. Major road and rail hub, Charleroi has about 205 000 inhabitants (425,000 in the metropolitan area – the 5th of Belgium – which runs from Thuin to Sambreville). It is thus the first Walloon municipality, the second after Liège agglomeration in terms of population and the third Belgian municipality. Its inhabitants are called “Carolorégiens” (abbreviated: Carolos). Charleroi is an industrial center: steel, glass, chemicals, electrical engineering, mechanical engineering. The city is the center of a large coal basin, now completely abandoned, formerly known as Black Country. Charleroi has an important cultural dimension through its many museums and theaters. She witnessed the rise of many talents of strip cartoons under the guidance of its famous “school of Marcinelle”, whose statues decorate the city with the heroes. Charleroi is an important educational center. Charleroi, rich in infrastructure and sports clubs, is also present in sport. Charleroi is the seat of the social institutions of the Walloon Region. the EVS is an opportunity to open to a foreign culture (country and population). We do not have a predefined profile for sending young people abroad. We have relationships with foreign host and sending organizations to which we periodically send a list of EVS vacancies for which we are coordinating Org. – See them before their departure and arrange their travel (train or plane), have them sign the reserved part of the Cigna insurance and give them a folder containing all relevant informations for the EVS project (2 Hr). In general, in the first instance, contact with the hosting Org is taken by BSC Namur. It is always advisable that candidates make personal contact with the responsible one of the Hosting Org to get a response to some personal issues, and anyway if possible, the volunteers have to arrange their departure in coordination with the host Org. After hosting a few years ago an Australian student whose native language is English, we want to extend this experience as part of EVS. We are ready to welcome young people whose first language is Dutch, English or German to develop under the guidance of our language teachers, workshops conversations. We believe that &quot;native speakers&quot; will allow our students to gain not only additional knowledge but also further practice which will master the accent of the taught language. A weekly program will be established with managers and language teachers to occupy and train students in various aspects of education and this education from kindergarten to the high school. We also will contact the High School located on our site that trains teachers for secondary education. As long as they wish, after a period of integration and running-in of the Institute the opportunity to develop a personal project will be given. This personal project must obviously be integrated in the educational objectives of the Institute. We propose to European volunteers to get involved in the activities developed at the Loverval such as educational, sporting, cultural or horticultural. We offer them to follow two French classes half days tailored to foreign national. Details of the proposed activities. Collaboration with the educational team at conversation tables organized for the students during the courses in modern languages ​​(Dutch, English). Construction and presentation of one or more sequences of courses in collaboration with teachers of history, geography, economics and physical education. Opportunity to support a member of the teaching staff as part of evening studies. Participate in intramuros sports at the institute: tennis, climbing, swimming pool. Possibility of developing an after-school activity in the context of sports. Participation in cultural activities inside and outside the school. Historical sightseeing, discovery theater. Opening to the world through awareness days in contrast, nonviolence. Opportunity to accompany students on field trips: cities, cultural places and trips abroad (Paris, Rome …). Opportunity to invest in a theater workshop for the preparation of school show. organizational ability and management of the library of the IND. IND, situated in a green, requires constant maintenance work. Opportunity to participate in the management and the various works of the field with the teams responsible. Discovery of experimental vineyard located in the school grounds. The Workshop Lovervalois the Circle Bridge, Table Tennis, vocal group &quot;La Chanterelle&quot; horticultural circle &quot;The Magniolia&quot; Scout unit &quot;Saint Hubert&quot;. – To allow them to discover, share, soak in the daily life of an institution like ours. – To promote personal enrichment in terms of exchanges of real and human experiences. – To facilitate their integration into our teachers and to be recognized as full participants. – To enable them to make their own contribution to live our educational project in a team. The volunteers we would like to participate would be interested in the world of education, have good knowledge of the Dutch or the English, wish to integrate into a school for young people of all ages and have the willingness to learn French. 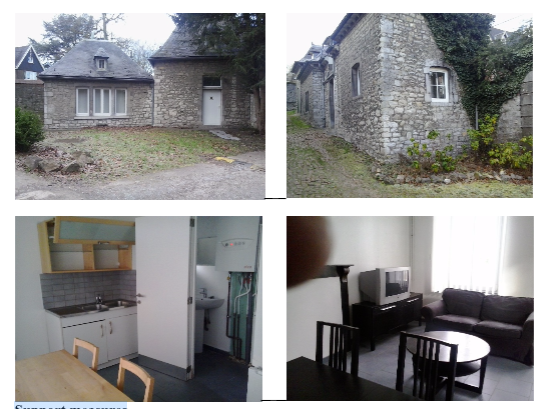 Two furnished houses situated inside the school grounds are foreseen for the volunteers. The accommodations include a fully equipped kitchen: fridge, stove, kitchen utensils and dishes, a lounge with TV and two communicating bedrooms. Regarding the bedding, only towels are not provided but will be furnished by the Coord Org. A washing machine, connections wifi and TV are available. The meals during the service and during the school periods are provided by the hosting project which has a cafeteria. Outside these periods, an allowance to buy food to be prepared in their homes is given to the volunteers. The amount of the allowance will be specified in the Activity Agreement with each volunteer. The volunteers will have a monthly bus pass to travel to the city of Charleroi. Quarterly, they will also receive a go-pass (= 10 train trips for Belgian destinations). Belgian Service Club Namur, coordinating organization, in association with the Institute of Loverval, will take measures to ensure that volunteers receive, throughout their stay, a language training (French as foreign language) in a competent school. The program of the service will be accordingly adapted. Supervisor: member of Coord Org (Belgian Service Club Namur asbl) that maintains contact between the Institute and volunteers, monitors the project and intervenes if necessary in case of problem. A tutor will be appointed to ensure the integration and monitoring of volunteers. He will assist them in their first administrative steps (registration to the municipality, purchase transport passes, …). He will oversee and regularly evaluate their service, he will advise the volunteers for the Youthpass, in collaboration with the supervisor. He will propose a final report for each volunteer at the end of the service period. Each volunteer will have a referent among our institute and a referent among our directors. In addition, two school concierges will be available during school holidays and weekends. On the site, two resource persons are established and may help the volunteers. Mr. Paul Eloy, retired French teacher and living in a house at the entrance on the road Philippeville (in front of a house for two volunteers) and Mr Carlo Baron, living in the other entry on the side village (in front of a second home for two volunteers) Mr. Baron has a walled vineyards within the site and can initiate a volunteer for the cultivation of vines. – In the middle of the Institute and the city of Charleroi. All administrative activities are accompanied by the supervisor and / ortutor (Registration, bank, subscription, registration in language courses or other …). The second week will be specially dedicated to the integration in the service. A member of the EVS team BSC Namur, will supervise the volunteer throughout his service and for this purpose will meet or establish a regular contact (Min once a month) or at his request. The project referent supervise volunteers. Daily contacts are possible and debriefing sessions will be organized in principle once a month. Volunteers will be involved in the preparation of language workshops. The Youth Pass will be prepared by volunteers with the help of the tutor and supervisor of The Coord Org. 1. locally by daily volunteers contact with their referent and tutor and very regular contact with the supervisor of the Coord Org. 2. In case of locally major unsolved problem, the National Agency is informed and can take appropriate actions. 3. possible contacts made with the sending Org. 4. organized seminars during the service by the National Agency. 5. liability insurance covers the voluntary activities during the service. 6. An information pack is given and commented during the first week organized by BSCN and explains in detail what to do in case of conflict, accident, sickness, departure on leave or extended visit. 7. A list of referent people and phone numbers (hostind and Coord Org) also appears in the folder.